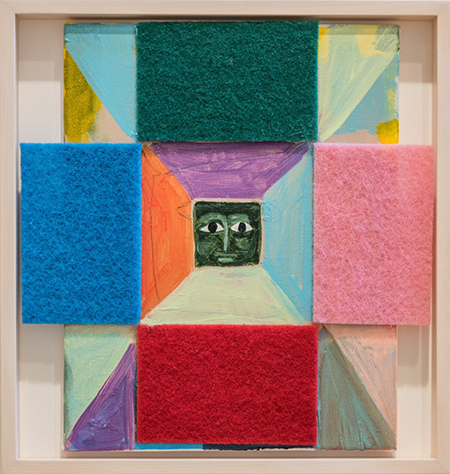 Alejandro Diaz, "Mask," 2016, acrylic and mixed media on canvas, 13 1/2 x 12"
Alejandro Diaz’s current show is a reaction to a major exhibition he presented two years ago at the Linda Pace Foundation in San Antonio. He fell into a deep depression afterward and feared that he would never make art again. In response to this, Diaz decided to “just make something — whatever felt right or whatever worked.” The 26 small paintings and mixed media pieces in this show are a direct result of that decision. These pieces are in marked contrast to those in his previous Pace show, which was aptly titled “It Takes a Village.” It actually did take a village to create the work, all of which were large-scale pieces made by outside fabricators to the artist’s specifications. In contrast, the paintings in this intimate group range from just 13 1/2 by 12 inches to no larger than 30 by 42 inches. Diaz began this series by experimenting with a few small paintings in his New York apartment. Subsequently he began collaging objects onto them — miscellanea like buttons, or objects found on the street such as seashells and a Pellegrino bottle. During this period, he leafed through art books constantly and made frequent visits to the Museum of Modern Art, where he was influenced by everything from Symbolism, Dada and Pop Art, to Folk Art, German Modernism and Mexican art. Diaz’s previous work was typically satirical and political, but in the new series, he has ignored politics and focused on bringing joy back into his work. One day he would study a Matisse, the next a Jasper Johns, then Anni Albers, Orozco, Picasso or Kahlo. Some of his paintings seek to capture an emotional essence, while others are humorous takes on masterworks. “Ceci n’est past une Pipe” was inspired by Magritte’s painting of the same name, but here Diaz uses a piece of wood for the stem, a length of silver tubing for the bowl, and a cotton puff for the smoke. “Kass in a Kaftan” is a riff on Gustav Klimt’s “The Kiss” and Deborah Kass’s “Blue Deb,” which itself is a takeoff on Warhol’s “Liz #5.” His ironic sense of humor is apparent in paintings like “El Grito,” which is loosely inspired by Edvard Munch’s series, “The Scream.” Diaz paints the scream on the face of a man carrying a basket of wares in a Mexican mercado. Diaz began his artistic career by making cardboard signs, which were hand-drawn to resemble the battered signs held up by roadside panhandlers. His messages, however, were clever phrases like “I Beg to Differ,” “Make Tacos Not War” and “Emotionally Moving Sale.” As a San Antonio native who grew up in a Mexican-American working-class neighborhood, Diaz was surrounded by people who fixed things with whatever resources were available, decorating their homes and yards with everything from spray-painted black velvet paintings to painted tires. After he moved to New York and needed money for rent, he started selling the cardboard signs on the street for a few dollars and discovered that he enjoyed interacting with people outside of the commercial art world. For the 2003 Havana Biennial, Diaz created souvenir items such as tote bags, beach balls, key chains and postcards bearing an “I (Heart) Cuba” logo. He gave them out free to locals, who in turn sold them to tourists. He followed this public-art piece in 2005 with an installation lining a Brooklyn street with large planters painted to resemble oversized cans of Mexican vegetables. From the beginning, Diaz has used his work to comment on race and class, but the paintings in this show reflect a decisive move away from the political arena. He has returned to basics by downsizing, simplifying and following his artistic instincts. The result is a highly personal body of work inspired by historical masterpieces and infused with an already well developed sense of humor that conveys the pleasure Diaz has rediscovered in making art.